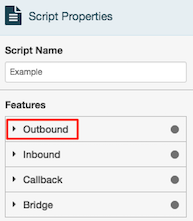 The Outbound property associates an outbound script with a campaign’s contact list, so that script editor can access columns in the contact list. Enabling this property signifies that the script is intended for use by an outbound dialing campaign. Click a script’s name to open it in script editor. The Script Properties panel appears. 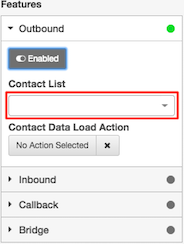 Click the Outbound property group. Click the Script dropdown again.